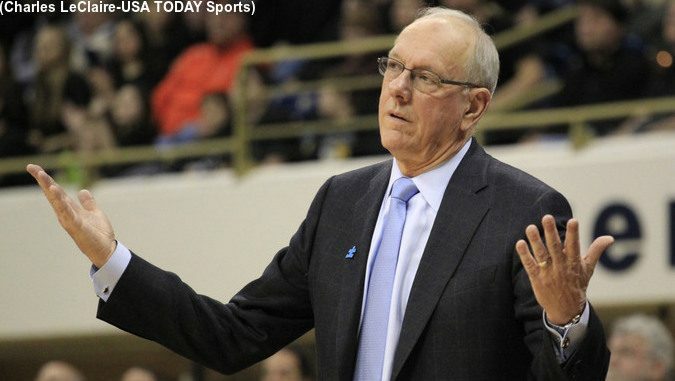 Syracuse Orange head coach Jim Boeheim gestures on the sidelines during the second half. Mandatory Credit: Charles LeClaire-USA TODAY Sports. Syracuse’s 78-70 win against Wake Forest wasn’t just remarkable because it was a much-needed win over a conference team, or because Tyus Battle was on fire for 24 pts. It was not just because three starters played all 40 minutes, or because it was yet another nail biter. It was remarkable because walk-on Braedon Bayer stepped onto the floor. Bayer checked in with 9:52 left in the first half and played for four minutes. During that time he snagged two rebounds, stayed active at the top of the zone, and managed to get himself called for a foul. Basically, he did exactly what he was supposed to do. Bayer played the most “non-garbage-time” minutes for a walk-on since Justin Thomas checked into the fifth overtime in the iconic six-overtime win versus rival UCONN in the 2009 Big East Tournament. His teammates were proud of his performance, but none were surprised. Boeheim had made rumblings to the media that Bayer might play starting in late January, but Bayer says the whispers have been going on for longer. He has been told by the coaching staff to “stay ready” for about a month, so much that it has turned into a joke on the team, with players telling him to “stay ready” at random times, whether there is a game, or not. Joking aside, when the moment finally came, Bayer was ready when Boeheim signaled to the bench. Bayer may have an opportunity to get accustomed to it. With just six more games—four against AP top 25 teams—and not much depth on the Syracuse bench, Boeheim may be calling more on the junior guard.